Our family has been cycling the world since 1972. Our parents, Rick Price and Paola Malpezzi Price started operating trips with their company Bike Across Italy in 1972 and went on to operate Italian Specialty Tours, Inc. and ExperiencePlus! Specialty Tours, Inc.
Today Cycle Europe is a brand of BikesPlus SRL*, a cycling tour operator and bicycle rental company based in Emilia Romagna and Tuscany – owned and operated by Monica and Maria Elena Malpezzi Price and Michele Boglioni, Monica’s partner in life and business. 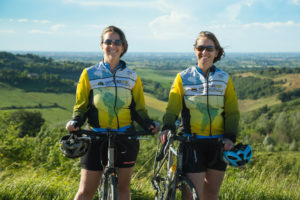 Monica and Maria Elena are also co-owners of the guided bike tour company, ExperiencePlus! Bicycle Tours. As a family, we grew up planning, designing and guiding cycling tours throughout Europe and we are thrilled to continue that legacy with a strong foundation in Italy. As an Italian-American cycling family we spent our formative years living, working and cycling across cultural and language boundaries between the US and Europe. We realized a long time ago that cycling was the best way to slow down and see the world. We hope we can help you do the same. Stefania is a Forlì, Italy native. 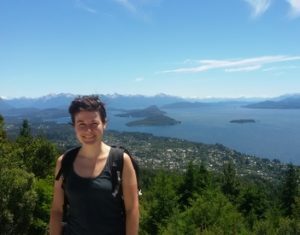 She previously worked as a computer programmer and systems analyst, but left that life behind to spend more time on a bike. When she is not working for Cycle Europe, she likes traveling to far flung places such as Nepal, India, Costa Rica, and New Zealand. Stefania loves meeting people, experiencing different cultures, and exploring countries at the speed of a bike. Outside of the office, Silvia enjoys mountain biking as well as road cycling, lindy hop dancing and live music. Languages: Italian, English and some French. Favorite bike item: my helmet. Favorite place to ride: anywhere with little traffic and nice views. Next dream vacation: anywhere but cycling! Igor is a master of logistics. During our busiest season in Europe he assigns equipment to all European tours and supervises the movement of vans and bikes traveling throughout Europe. Additionally, he works with our full time mechanics to ensure all bikes are in top shape before leaving our Italian headquarters. He also is one of our star tour leaders in Europe. In his spare time he can’t get away from biking and he spends his vacation bicycle touring with his family. Igor has been skateboarding since he was thirteen and loves helping friends build parks and ramps. Although he does not drink coffee, does not follow soccer, and has a Russian name, do not be fooled, he is 100% Italian. Javier is a lover of active travel and joined us recently after moving to Italy with his wife and three small girls from Texas. His experience organizing and leading cycling tours in South America and Europe, as well as his background in relationship sales and marketing, made him a great fit for our growing team at Cycle Europe. Born and raised in Patagonia, Argentina, his father’s work took his family to the United States, Norway, and Venezuela, among other countries while he was growing up. After studying International Business in Texas, he spent a decade working as a sales rep for tech companies in the Caribbean and Latin America (five years living in Mexico, a country he misses dearly!). 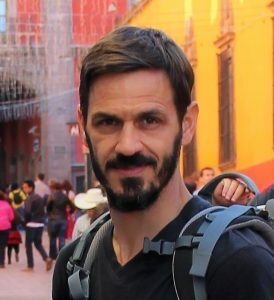 These experiences forged his passion for travel, and he eventually left the “corporate world” to start exploring the “real world.” In his journey to discover the real world he traveled throughout Latin America, doing everything outdoors – he worked as a scuba diving guide in Brazil, explored jungles in Central America and marveled at the ancient Mayan ruins in the Yucatan. And he crossed Argentina, Chile, Uruguay, and Brazil by car, by foot and bike. Today all his time (and energy) are spent with his family, who luckily share his curiousity and lust for travel! Next dream vacation: so many places I would love to visit! New Zealand, Argentina, Siberia in Russia…but I would also love to explore Italy more. Giovanni is a Bologna native and lover of all things cycling. 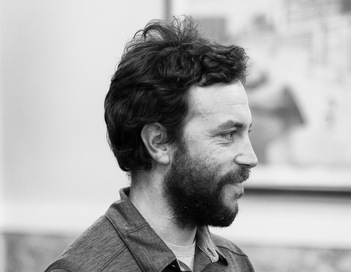 Giovanni received a master degree in Development Innovation and Change from the University of Bologna followed by a master of Sustainable Development from Utrecht University in the Netherlands (where he learned to tolerate cycling in wet, windy conditions). Upon finishing school in the Netherlands Giovanni returned to Bologna where he owned a bicycle shop specializing in assembling and restoring vintage bikes. Giovanni wears many hats around Cycle Europe including travel logistics, customer support, and working in the bike shop. When he’s not at the office or out delivering bikes you can often find Giovannini cycling – be it around the city or on long-distance trips through Europe. Next dream vacation: I believe you don’t need to travel very far to find beauty and joy. Happiness is just around the corner if you know where to look. He is well known in the office for his sense of adventure and for the delicious bread he bakes. Next dream vacation: Mountain biking in Colorado and Utha. Michele grew up in a village at the base of the Alps, in Lombardy. He studied Environmental Science in Milan and tried working in the environmental law field, but the call to adventure was too great. He headed to Australia for six-months of backpacking, then returned to Italy and started teaching at an environmental education school. He has also worked as a guide in a natural reserve and as a tour leader for other companies. Michele has a long history leading cycling tours for the BikesPlus group. Now busy at home with a growing family, he works from our farm headquarters as our chief tour designer and stays very busy managing our routes and tour quality control.